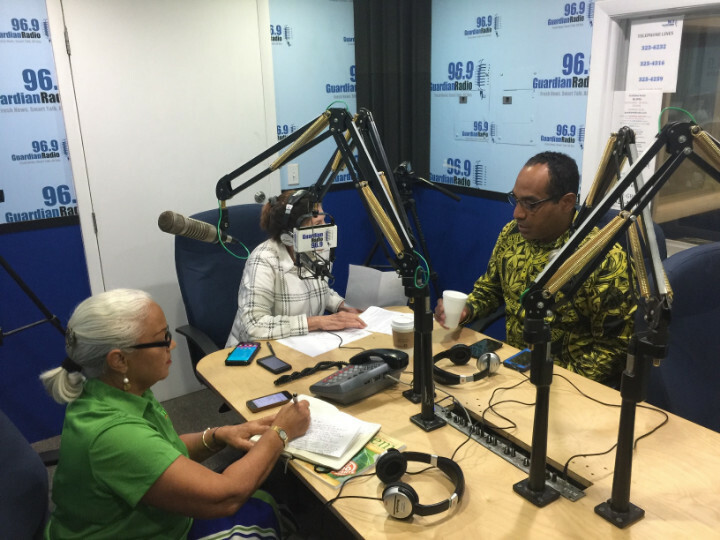 Morning Boil – Minister of Environment and Housing Romauld ‘Romi’ Ferreira kicked off the #Be A Hero campaign with a round of radio appearances including one on Island FM’s popular morning show, Morning Boil. 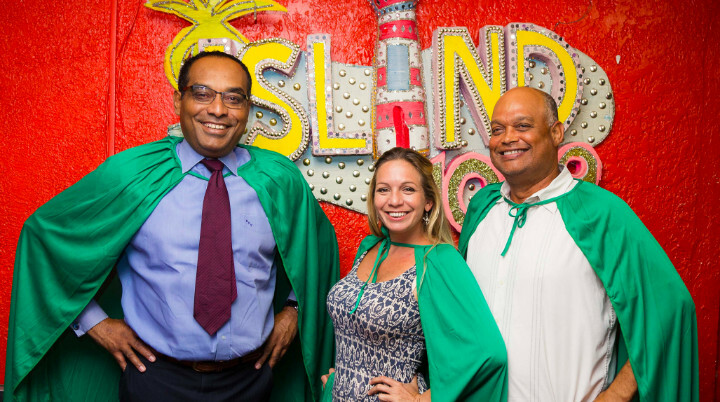 The Minister and co-hosts Catherine Chisnall and Eddie Carter got into the spirit donning super hero capes to encourage schools to get involved, choose a project, post images and messages on Facebook, Instagram, Snapchat and Twitter to win the six-month competition demonstrating how they are doing their part to create a cleaner, safer Bahamas. Environment and Housing Minister Romauld ‘Romi’ Ferreira hit the airwaves from one end of the dial to the other like a sprinter with a microphone to spread the message of getting involved in the #Be A Hero campaign – a program aimed at instilling a renewed sense of pride in surroundings and respect for the environment by involving every student in primary and junior high school in New Providence. The Cabinet minister on a mission has been interviewed on Guardian Talk Radio’s Connected Show twice. He’s done Morning Boil with Eddie Carter, 100 JAMZ, and Morning Blend with Dwight Strachan. He’s done TV interviews and has committed to 12 school visits in person. “This campaign, #Be A Hero, is so important. It is the second phase of our determined effort to make The Bahamas the beautiful, clean, green and safe place it can be,” he said. According to the Minister, the first phase began in October 2017 with sweeping clean-up campaigns that cost the people of The Bahamas about $100,000 a day. 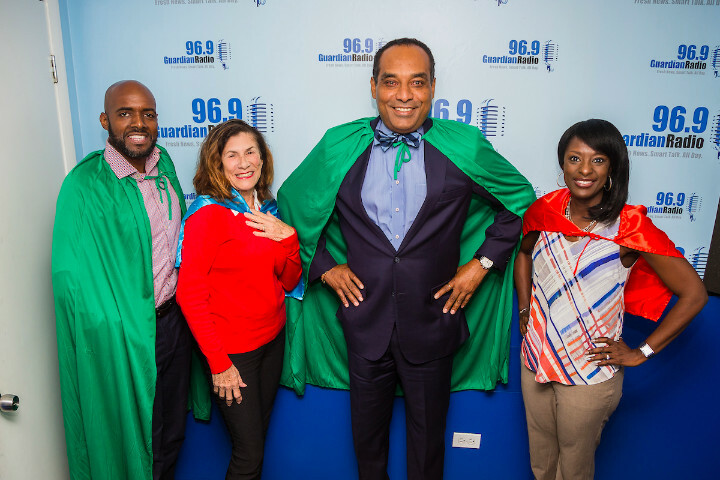 Morning Blend – Dwight Strachan, Guardian Talk Radio’s popular early morning host, far left, and co-host Pamela Musgrove, far right, don super heroes’ capes to show support for the #Be A Hero campaign launched earlier this month. With more than 10 corporate sponsors including AML (Solomon’s), Atlantis, Bahamas Hot Mix, Bahamas Waste Management, Bahamas Wholesale Agency, Commonwealth Brewery, Kelly’s, McDonald’s, Seaside Media, The Sign Man, The Tribune and ZNS, the campaign drives students to become social media stars by choosing a project at their school or in their community, posting progress and showing success. At the end of six months, the winning classes’ images will replace sports, entertainment and civic images as the nation’s heroes for making their communities clean, green and pristine. Minister of Environment and Housing Romi Ferreira, 2nd from right, is also joined by Diane Phillips, whose agency partnered with Barefoot Marketing, Grand Bahama to develop the kid-friendly campaign and raise sponsorship funds to support it. The second phase kicked off earlier this month when #Be A Hero was launched at a packed press conference hosted by Atlantis, one of the campaign’s 10 corporate sponsors. Hello, heroes -- More Minister of Housing & Environment Romauld ‘Romi’ Ferreira with Sarah Kirkby of Barefoot Marketing on Island FM’s Morning Boil, one of many radio interviews the Cabinet minister is doing to spread the #Be A Hero campaign message. The program aimed at instilling a sense of pride in surroundings and personal responsibility for environment was launched to appeal to students throughout New Providence two weeks ago and is gaining ‘extraordinary’ traction on social media. According to Environmental Officer in the Ministry of Environment and Housing Kendria Ferguson, students can plant a vegetable garden, clean up a nearby park, raise funds to purchase more trash receptacles or find creative ways to ban single use plastics on their school grounds. Options are endless. “This campaign is all about respect for the environment and the environment is everywhere, it is tied into everything, the air we breathe, the water we drink or bathe in, the weather we experience, what we see and feel all around us,” said Ferreira. Connected – Environment and Housing Minister Romi Ferreira makes the radio rounds, connecting with 96.9 Guardian Talk Radio co-host of Lester R Cox Connected in the 9 am hour to spread the message of what it takes to be an environmental hero. Pictured l to r, Abaco Neem farmer Daphne DeGregory, host Diane Phillips (partially hidden by microphone) and Minister Ferreira. The campaign, created by Barefoot Marketing and Diane Phillips & Associates, is funded almost entirely through corporate sponsorship. Among the sponsors are Atlantis, AML (Solomon’s), Bahamas Hot Mix, Bahamas Waste Management, Bahamas Wholesale Agencies, Commonwealth Brewery, Kelly’s, McDonald’s, Subway, Seaside Media, The Sign Man and The Tribune, the Bahamas Ministry of Tourism and ZNS. In addition, the Ministry of Education paved the way for school participation.